We are happy to provide you with more than custom programming of studies. We have extensive EasyLanguage Consulting experience you can benefit from. Please find a couple of areas we have worked in before and areas in which we have provided solutions to our clients. In case you need anything we haven’t covered below, that doesn’t mean we are not able to help you with or at least provide you with information on where to find what you are looking for. Don’t hesitate to contact us with your request. We will find a solution for you. We offer assisting you in doing research for your trading ideas and help to find an edge that works for you. Please check the research page to find out some more about the ways we can help you to improve your trading. This works for both manual or algorithmic trading. We are proud to offer you EasyLanguage consulting services that go beyond the scope of programming a study. 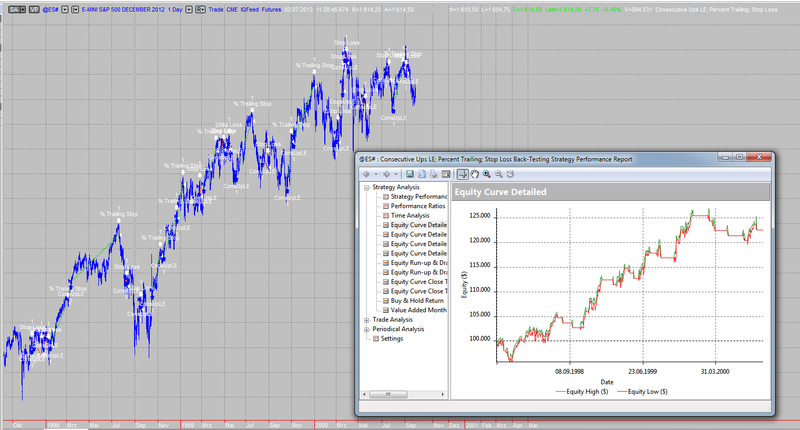 We can help you in learning how to efficiently use Multicharts and Tradestation. We can teach you how to modify studies using EasyLanguage and PowerLanguage. This can be done with one on one teaching lessons via Skype and remote desktop sharing. We can help you finishing a project on your machine or solve a particular programming problem. Our customer service goes beyond what the software companies are able to provide you with. With today’s computing power, code calculation becomes less and less of a factor. For indicators and signals you simply load to a chart it’s mainly a matter of convenience when a study is able to calculate in a couple of seconds versus a minute. When it comes to optimization runs with a lot of optimization cycles the calculation speed can quickly add up to hours or days. That’s when you can really benefit from optimizing code specifically for calculation speed and drastically cut down the optimization time. In various EasyLanguage Consulting projects we have been able to speed up code by ten times or even more. This doesn’t work for every code of course as it depends on code length and complexity. A code with just a few lines doesn’t offer much room for improvement and therefore the difference in speed will be slim to none. Testing a strategy’s historical performance (backtesting) can be a useful method to check it’s potential. However past performance is no clear indication for future performance. Markets are constantly changing, going through different trends or periods without strong directional conviction. Let’s look at an example of a strategy for demonstrational purposes. It’s not meant to be traded and the historical performance is hypothetical and can’t be reproduced in a real market environment. During the major bull trend at the end of the previous century and into the millennium the demo strategy displays a positive return. The strategy equity curve is almost reflecting the chart and starts to decline, after the market topped, too. This is a simple test of course and the strategy is taking only long entries. This will make it hard to gain money in a declining market. Again this is only to demonstrate a point and strategies much more complex can show similar characteristics when the market direction changes. It is very easy to fall for tunnel vision. Testing the performance of a strategy can be important as it offers the possibility to modify or know when to stop trading a certain strategy. We can help you avoiding this caveat and other fallacies with our EasyLanguage consulting experience.So you can back test the strategy for its full potential. Although backtesting can provide you with better results, it’s important to understand that it doesn’t mean the identical results can be achieved in live trading. It is not possible to recreate all real-time factors in backtesting, even with today’s sophisticated programs. Contact us now and find out how you can benefit from our EasyLanguage consulting.